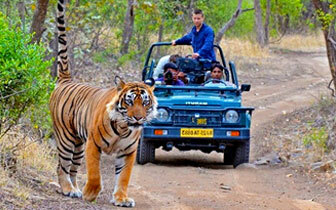 With this journey, you can explore the true gems of India. The preciousness of Indian gems resides in its shimmering greens, its iridescent heritage, and its architectural marvels. With this unique Gems of India route, you can visit the iconic epitaph and monument of love- Taj Mahal, catch the sight of the elusive tiger at Ranthambore and explore the Indian culture in Jaipur. The tour stretches up to four days and each day brings a new city to explore.The season for this unique Gems of India journey starts in October and ends in April. You can always choose to either end or start a year with us amidst luxury and opulence. Guests board the palatial train at Safdarjung Railway Station, Delhi and are grandly welcomed as per Indian traditions. Check-in formalities are also carried out on the first day. Guests can pamper their taste buds with an on-board dinner in the train's two thematically designed restaurants- Mayur Mahal and Rang Mahal. 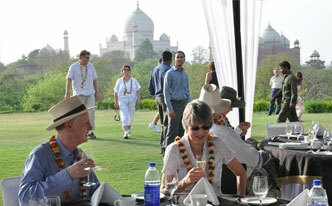 The Maharajas' Express proceeds for the alluring city of Agra. Guests spend overnight on the palatial train. The second day of the Gems of India tour begins at Agra where guests visit the Taj Mahal, the famous epitaph of Mughal Queen, Mumtaz Mahal; an architectural marvel and an eternal symbol of love. Visit to Taj Mahal is followed by a sumptuous Champagne breakfast a top Taj Khema. Return to comforts of Maharajas' Express or visit Itmad-ud-daula, another epitome of amazing architecture or visit Fatehpur Sikri, the ancient Mughal capital, as an optional tour. Guests can have lunch on-board in the palatial restaurants. Post-Lunch guests can either proceed to visit the Agra Fort or choose from optional activities such as Spa at a 5 star hotel or a private shopping tour. After that, guests can return to the comforts of the Maharajas' Express or may watch "Mohabbat-e-Taj Show" as an Optional Activity. Treat yourself with different cuisines on on-board dinner. 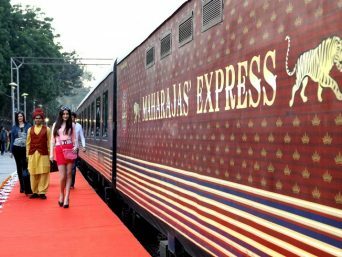 The Maharajas' Express leaves for Sawai Madhopur, the first city in the regal state of Rajasthan under the Gems of India route. Each day gets more exciting in Gems of India journey and the third day begins with the train's arrival; at Sawai Madhopur. Guests proceed for an exciting Game Drive at Ranthambore National Park, where they can spot the elusive tiger crouching amidst the sprawling greenery. After the adventurous odyssey guest can return to the Maharajas' Express. Begin your day with a wholesome breakfast on board. The Maharajas' Express departs for Jaipur, the final destination under the Gems of India route. Guests are served with delicious lunch on Board. 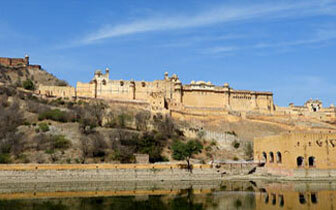 Arrive at the Pink City, Jaipur Guests can then proceed to visit the Amber Fort or may also choose other optional activities such as Spa facilities at a 5 star hotel or a blissful session of private shopping tour or an exciting visit to City Palace and the Observatory (locally known as Jantar Mantar). With Gems of India tour you can soak in the brilliance of the archaic era as guests can proceed to City Palace/Jai Mahal Palace for an exclusive Elephant Activity, where guests may choose to indulge to paint them, feed them or take the royal ride followed by an enchanting dance performance and dinner. 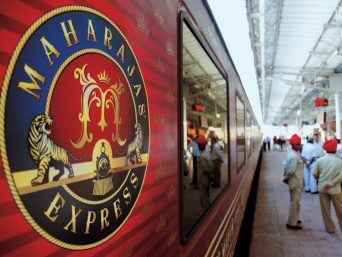 Return to the abode of luxury, the Maharajas' Express. 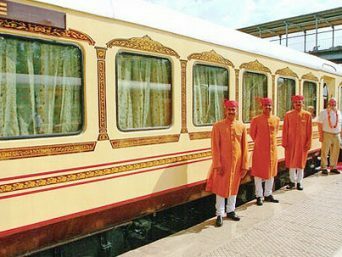 The Maharajas' Express leaves for Delhi and guests spend night on-board.